Prevention is the most cost-effective way to manage Johne’s disease. It is far less expensive to block introducing Johne’s disease into a herd than it is to control or eradicate the infection once it creeps in and invisibly starts to spread. Risk management is the foundation of any good animal care program; the risk of becoming infected by bringing in infected cows is manageable. Smart buyers will apply the concepts of risk management and require diagnostic test results for the source herds to limit their risk as much as possible. At least 8% of United States beef herds are believed to be MAP-infected. Owners must recognize the risk of buying MAP-infected animals if they do not purchase from test-negative herds. You are better off buying a test-negative animal from a herd with a known low test prevalence than buying an animal from a herd that has no clue about its Johne’s disease history. In addition to buying it in, other routes of introducing MAP infection exist, but they are of much lower risk (although data is limited quantifying these risks). These other routes include spreading manure from potentially infected farms on land the herd owner uses for grazing or forage production, use of colostrum or milk from dairy herds of unknown status for hand-rearing orphaned neonates, or animal access to run-off water from adjacent farms. These routes are theoretically important, but the risk of acquiring the infection from them is likely much lower than through the purchase of animals. For the beef industry, self-regulation to encourage open discussion of Johne’s disease and marketing of animals from test-negative herds is the best way to manage it. The most cost-effective way to deal with Johne's disease is to avoid the infection totally. M. a. paratuberculosis (MAP) most often enters herds when managers unknowingly purchase infected cattle. 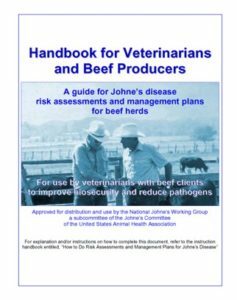 Prevention of Johne's disease involves common sense practices ("biosecurity plans") to limit the risk of bringing infected animals into your herd.